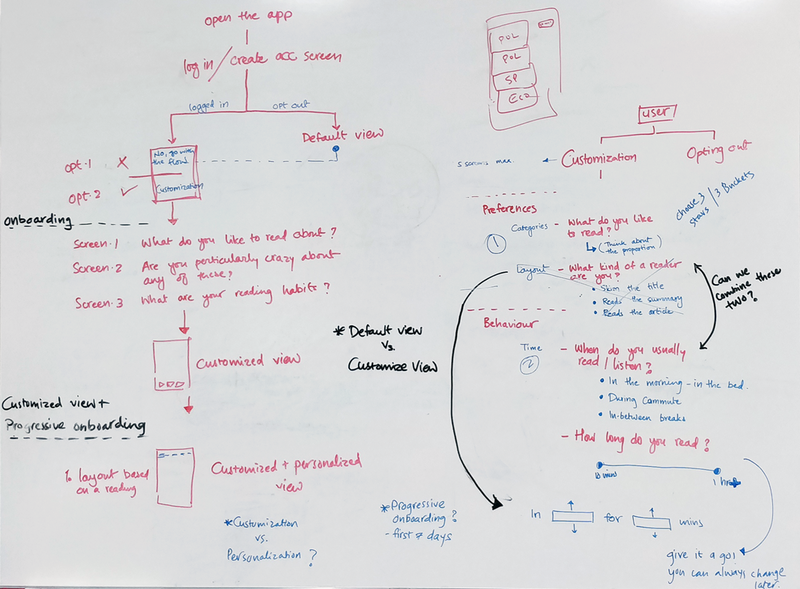 As a team, we contributed equally during research, interviews, and synthesis, which helped us uncover key insights about user needs and habits. After collaborative ideation, I took the lead on wireframing and UI design. Our solution was presented to a team of 20 researchers and designers at the New York Times headquarters. As this project piqued my interest, I took it a step further to incorporate the feedback from the NYT team, which led to the refined solution presented here. In this mobile era, consumption of news is increasingly shifting to the realm of smartphones. This makes digital subscriptions a primary revenue source for the New York Times. The NYT challenged us to understand the needs of their readers, and explore how to incentivize them to become subscribers. In particular, the brief was to understand the perception of voice, tone, and diversity of content, and how it affects digital subscriptions. Our research indicated that while readers appreciate the serious voice and tone of the Times’ journalism, they perceive its content to be too politically focused and lacking in diversity. The problem was that readers weren’t able to quickly access the wide variety of content that NYT offers. This important insight helped us redesign the app experience to make its diverse offerings more accessible, which can ultimately lead to more subscriptions. In preliminary desk research, we found that the best predictor of whether someone will subscribe is the number of times they interact with the service. This is especially true in the NYT’s case as readers hit a paywall after reading 10 free articles in a month, and must move down the tunnel to become subscribers afterward. In our research, we found that younger readers are the NYT’s largest category of readers — 40 percent of the Times’ mobile audience is under 35 — but lag behind other groups in moving down the subscription tunnel. Hence, we focused our attention on young readers (age 25-39) who read the NYT 4-9 times per month but haven’t yet subscribed. Identify opportunities to add high-value features that they are interested in. We started off with desk research to learn about the preferences of younger audience. Subsequently, we launched a survey to listen to what the target users had to say. 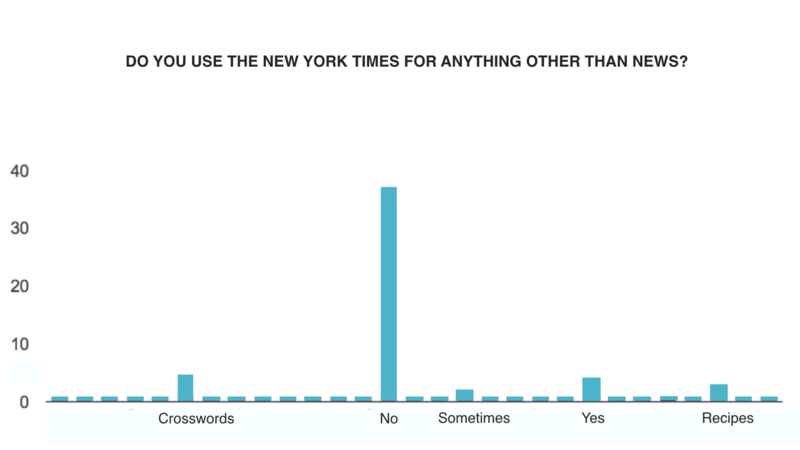 79 respondents described their perception of and expectations from the NYT, giving us a broad understanding of their needs. Finally, to dig deeper into their reading habits, we conducted 12 one-on-one interviews. Our research helped us uncover key insights, both about how readers perceive the voice, tone and diversity of the NYT’s content, and about how their interests and reading habits affect their experience. 1. Readers appreciate the serious tone of the NYT. We learned that the overall perception of the Times was that of a trusted and unbiased news source. We constantly heard that the “serious” tone of the NYT’s voice was perceived as a positive trait and added to the credibility of the NYT. 2. Diverse offerings of the NYT are not visible to the readers. Another key finding was that an overwhelming number of respondents weren’t aware of the NYT’s diverse offerings outside of what they deemed as “serious” news coverage. Many readers found their feed too politically focused (this was in 2016) and lacking in diversity. They expressed desire for a customized feed to read about topics of their interest. We found that the NYT offered diverse enterprise content, but it wasn’t easily accessible, resulting in the apparent lack of diversity. 3. Readers’ reading habits are dependent on the place and time of day. Reuters Digital News Report shows that the top three locations for readers to consume news are in bed, in bathroom, and during commute, and the location affects how much time they have. For example, a majority of our respondents skimmed through news for 10-15 minutes during their morning commute, but had more time to read in depth at night. It is crucial to offer readers diverse content to read within their time constraint. How can we enable readers to quickly consume diverse content and make the experience worth their while? Upon brainstorming ways to increase visibility of the NYT’s diverse offerings, and consequently, increase its digital subscriptions, the idea grew around the following observations. Customization is the key. Our research indicated that different readers have very different needs; “one feed wouldn’t fit all”. 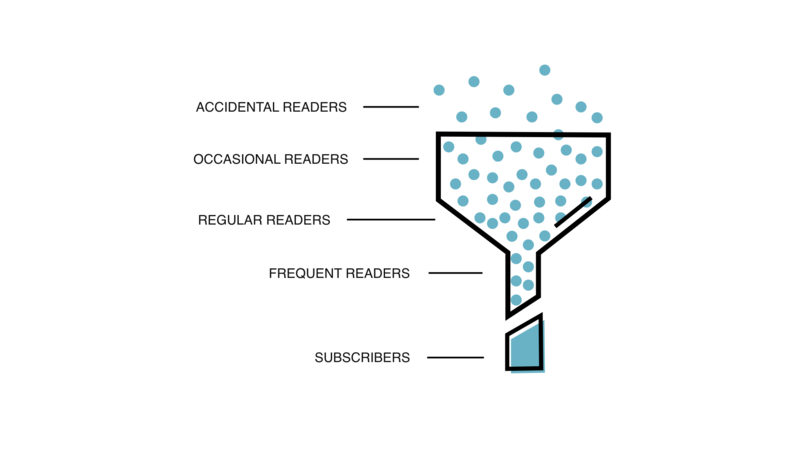 Adding a feed customized based on the reader’s interests and reading habits would add significant value. To learn more about the reader from the get-go, it was necessary to add an onboarding step. Quick navigation is essential. Another highlight of our research was that readers are time-constrained, and want quick access to diverse content. The hamburger menu currently hides many valuable features such as stories about different topics, the search tool, and bookmarked articles. These features should be quickly accessible. Subscription benefits should be transparent. The survey respondents hardly talked about subscription. To them, it was something you have to do when you cross the “10 free articles per month” limit. Instead of forcing their hand, the goal should be to incentivize readers to subscribe by clarifying the value proposition. 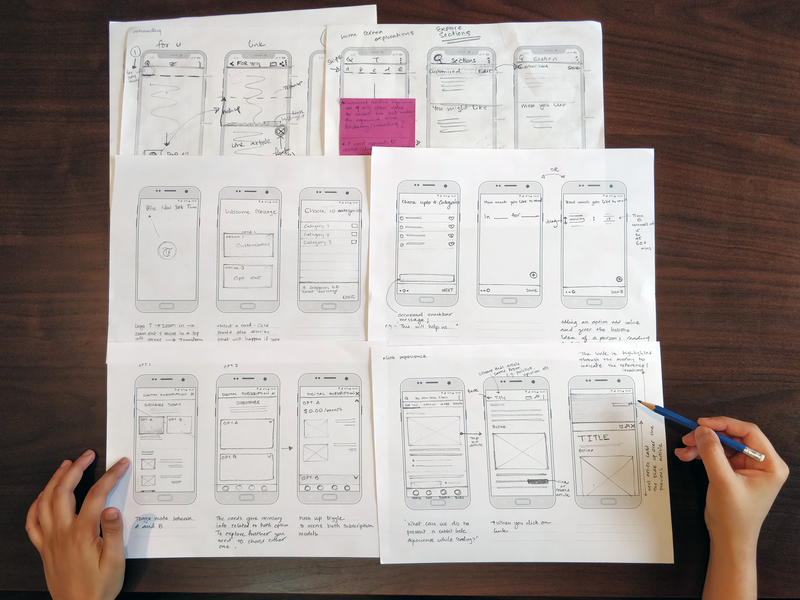 While prototyping, the main challenge was to ensure that navigation remains quick and simple at every step. Since the NYT app is content-heavy, it was crucial for navigation and the subsequent interactions to not be overwhelming, so readers keep their focus on the content. A friendly onboarding allows readers to customize their experience based on their interests and reading habits. They can not only indicate which topics they like to read about, but also how much. They can even express for how long they usually read at different times of day. With this information, the NYT creates a customized “For You” feed. This allows readers to consume diverse content of their interest within their available time, leading to increased reader satisfaction. Reading stories about different topics, accessing saved bookmarks, and searching for articles are all ways to consume diverse content. Previously, these features were hidden in the hamburger menu and difficult to access. The redesigned home screen brings them to the readers’ fingertips, so readers can easily navigate to diverse content with a single tap. This quick and simple navigation allows readers to focus on the content. Unlike the print medium, the digital medium presents a difficult challenge: readers often go down a rabbit hole of links, which may sometimes eat up all their time. They also find it tedious to navigate back and often leave, creating a disconnect in their experience. The new design features a novel way to access links, which allows readers to stay connected to the original story, quickly return to it, and move on to accessing more diverse content. Digital subscriptions are at the heart of the new design. Instead of hiding the “Subscribe” button under the hamburger menu or at the end of articles, or forcing readers’ hand when they hit the paywall, it takes a different approach. The home screen now brings subscription right to readers’ fingertips in the navigation bar. A single tap reveals various subscription options and the associated benefits in a clear, concise, and transparent manner.